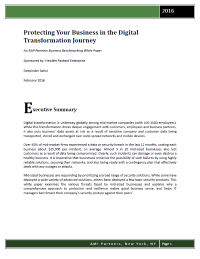 Download this white paper to learn the security shift mid-sized companies are seeing in an “always-on” business landscape, and how you can protect your organization’s data from being compromised. A hyper-competitive environment and dependence on data are causing mid-sized businesses to reevaluate their security solutions in order to mitigate theft, loss and sabotage. Digital transformation drives deeper engagement with customers, employees and business partners, but also puts business’ data assets at risk.